Founded in 1992, we are a 501(c)(3) charitable organization that currently has a database of over 20,000 alumni. We publish a newsletter called the Alumni TOOTER twice a year and distribute to all alumni, which contains news about fellow alumni including AlumNotes updates, alumni-related articles and notices of deaths. 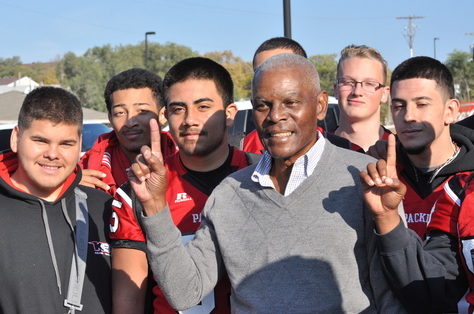 SHS football team members celebrating with Marlin Briscoe (1963) during Marlin's Street Dedication Ceremony in 2015. SHSAA was integral in the process of getting a street named after Marlin. We provide support to reunion committees by running labels, helping with mailings and spreading the word of upcoming reunions in the Alumni TOOTER and on our website and Facebook. We award scholarships and innovative teacher funds to provide opportunities for students to enhance and continue their education. We have awarded over $500,000 scholarships and innovative funds to teachers to date. We completed our long term Sports Complex projects which included Brown Park/John Stella Field (boys baseball complex), H.P. Smith Field (girls softball complex) and Collin Field (football, track and soccer field), by partnering with alumni, community leaders and foundations. We also recognize outstanding alumni, both athletes and all-around outstanding individuals with our Packer Sports Greats and Hall of Fame awards.